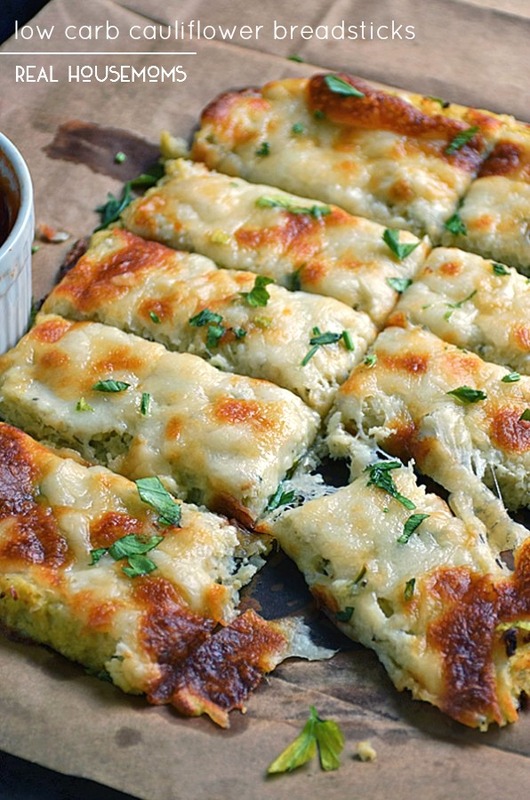 Low Carb Cauliflower Breadsticks with fresh herbs, garlic, and lots of ooey gooey cheese atop a cauliflower crust looks and tastes like cheesy bread. To rice the cauliflower I cored it and broke it into florets. Then I placed it in the bowl of my food processor and pulsed until it was the texture of rice. In a large bowl, mix the riced cauliflower, 1/2 cup shredded Mozzarella cheese, 1/2 cup Parmesan cheese, 1 egg, 1/2 tablespoon fresh garlic, 1/2 tablespoon fresh basil, 1/2 tablespoon fresh parsley, 1 teaspoon salt, and 1/2 teaspoon black pepper until combined and holds together. Place the mixture onto the parchment lined baking sheet and spread out into a rectangle about 9x7" and 1/4" thick. Bake in the preheated oven for 10-12 minutes. Remove from oven and top with 3/4 cup shredded Mozzarella cheese and return to oven to continue baking until the cheese is melted and starting to brown. Cool about 10 minutes and cut into 'breadsticks'. Garnish with fresh herbs and Parmesan cheese. Serve with your favorite Red Sauce and enjoy!